James Corden recruited the four male teenage stars from Stranger Things to join him in the Upside-Downs, a fake Motown vocal group, on the latest episode of The Late Late Show. 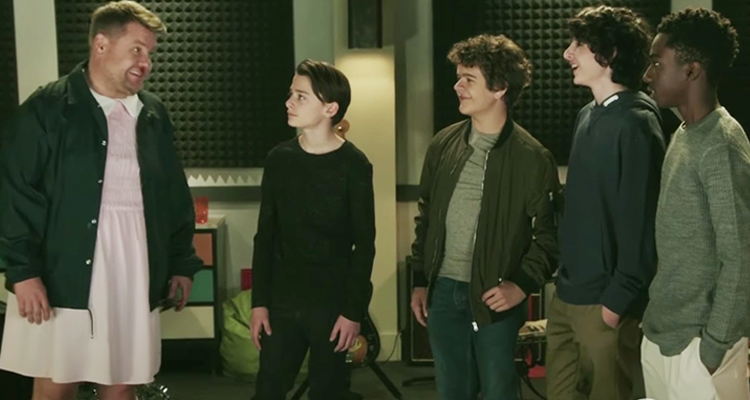 Finn Wolfhard, Caleb McLaughlin, Gaten Matarazzo and Noah Schnapp played along to Corden”s crazy sketch about their imaginary musical pasts. In Corden’s recollection, he and the four guys made a Motown cover band called the Upside-Downs before they were famous. “People thought it was weird that James hung out with us because he was an adult, but we actually went to school with him. He was held back a couple of years, but we’re in the same grade,” Wolfhard explained. After the Behind The-Music-style clip, the Upside Downs appeared on Corden’s main stage to perform a medley of hits by the Temptations, the Jackson 5 and the Four Tops. Check out the hilarious video below and let Corden, Mike, Will, Lucas and Dustin serenade you with their sweet, sweet chops. The Stranger Things cast has been a regular presence on late night television since the show’s second season debuted on Netflix last month. Brown was delegated to hit The Tonight Show, where she rapped a season recap. The four boys appeared on Jimmy Kimmel Live! this week.